LeRoy Percy is the rare Mississippian who may be best known for his tombstone: a bronze statue of a stoic knight in armor stands above Percy’s grave in the family cemetery in Greenville. Percy was a lawyer and levee supporter in Washington County, but he is most famous as William Alexander Percy’s father and as the best (and perhaps the last) example of the planter paternalist and gentleman in the Mississippi Delta, at least in his son’s eyes. 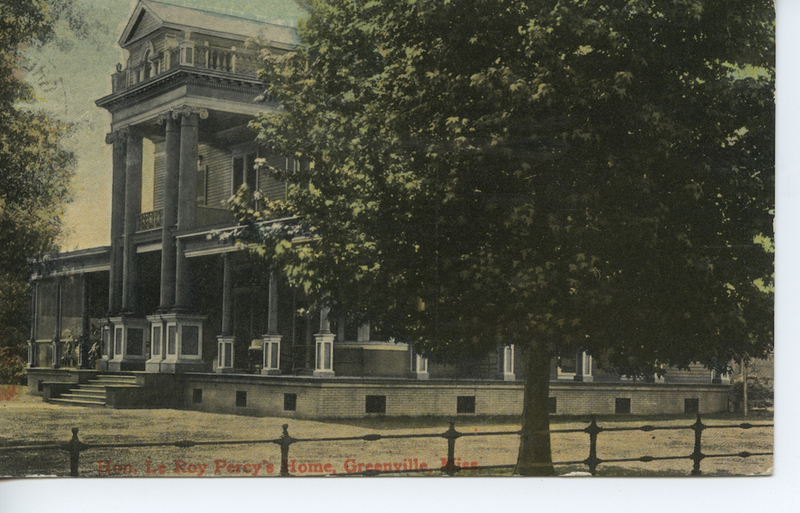 LeRoy Percy was born on 9 November 1860 in Washington County to Nannie Armstrong Percy and William Alexander Percy, a planter and lawyer who went on to serve as a colonel during the Civil War, earning the nickname the Gray Eagle of the Valley. As Speaker of the Mississippi House in 1876, William Alexander Percy was a leader in returning political power to white planters at the end of Reconstruction. Born into a family of land and wealth, LeRoy Percy graduated from the University of the South in Sewanee, Tennessee, in 1879 and earned a law degree from the University of Virginia in 1881. He was admitted to the bar later that year and opened a practice in Greenville. In December 1884 he married Camille Bourges, a native of New Orleans, and they enjoyed a life of travel, dancing, gambling, and hunting. Their first son, William Alexander, was born on 14 May 1885; a second son, LeRoy, was born in 1802 and died in a rifle accident ten years later. LeRoy Percy supported flood control through building and maintaining levees, made efforts to build new railroads, supported education and civic improvement, and, significantly, encouraged African Americans to remain in the Mississippi Delta as inexpensive labor. The owner of tremendous cotton acreage, he saw himself—and his family and supporters saw him—as an old-fashioned paternalist who took care of his workers but demanded that they recognize his control. When one of his farmworkers wanted permission to shop at a store other than the Percy-owned plantation commissary, Percy emphatically rejected the request: allowing the man to shop elsewhere would lessen “control over him, and then it puts notions in the heads of the other negroes.” He envisioned himself as a kind father figure and was famous for rejecting the overt racism of the Ku Klux Klan and political figures such as James Vardaman and Theodore Bilbo. In 1910 the Mississippi legislature elected Percy to fill the US Senate seat vacated by the death of Anselm McLaurin. The 1912 Senate campaign between Percy and Vardaman was particularly brutal and, according to Percy’s son, represented the final defeat for the kind of paternalism and good manners he represented. Issues in the campaign challenged the Percy family’s self-image as leaders with a sense of noblesse oblige and high character. On a symbolic level, LeRoy Percy sometimes carried himself with a reserve that some voters found too aristocratic. Opponents called him “Prince Percy” and “the dead-game plumed-knight of the Poker-table.” More specific charges hurt Percy’s pride. One of his supporters faced charges of bribery, though he was found not guilty. Percy also faced allegations that he had kept Italian immigrant workers as debt peons on his Sunnyside Plantation in Chicot County, Arkansas. He denied the charges but had difficulty combating accusations that he was not a man of the people. When some opponents shouted him down during a speech in Pike County, he responded by asking “what kind of cattle they thought these representatives were to be bought and sold on the hoof.” Supporters of Vardaman used that somewhat obscure statement to accuse Percy of referring to common people as cattle. Percy lost the election by a wide margin and never again ran for statewide office. Will Percy wrote a great deal about his father in his autobiography, Lanterns on the Levee. The 1912 election was a turning point for the younger Percy, who “became inured to defeat: I have never since expected victory.” LeRoy and his cohort cast such a shadow on Will and his generation that he subtitled his book Recollections of a Planter’s Son, identifying his father but not himself as a planter. Will Percy loved and respected his father but feared he did not live up to all of the standards—the love of hunting, for example, and the comfort with being in charge—he associated with his father. During the Great Flood of 1927, Will, serving as the head of the local Red Cross, wanted to help everyone, including African American farmworkers, leave the region for higher ground. LeRoy, working behind the scenes to support the interests of planters, who feared the loss of their inexpensive farmworkers, left them stranded on the levee. Camille Percy died in October 1929, and LeRoy Percy died the following Christmas Eve.